Don’t let excessive sweating ruin your life! Iontoderma has THE solution for you. For most, summer is the jolliest season of them all. The warm temperature makes daily chores look easy and any reason seems like a good reason to pull out the barbecue with some buddies. But for people who suffer from excessive sweating, summer is the worst season of them all. Lucky, an affordable solution exists, so everyone can enjoy a barbecue under the sun. Excessive sweating is caused by a condition called hyperhidrosis. Fair amounts of people suffer from this condition, about 3% of Americans, but most folks are ashamed to talk about it. In fact, only 40% of excessive sweaters ever talk about their condition with their family doctor. That’s why hyperhidrosis is called the silent handicap. Everyone one deserves to have a normal life. That’s why Iontoderma as worked hard to create a simple and affordable solution for people who suffer from excessive sweating of the hands and the feet, also called palmo-plantar hyperhidrosis. We are proud to say that our sleek solution as done miracles for excessive sweaters around the world. Iontoderma sells an iontophoresis machine. This proven technology as no side effects and it costs much less than other options, like Botox injections or surgery. The International Hyperhidrosis Society has even called iontophoresis the best treatment option. Numerous conditions can be linked to excessive sweating, like smelly feet or athlete’s foot. But sadly, nobody knows because there is such a taboo around excessive sweating. That’s why one of the missions of Iontoderma is to promote awareness and positivity around sweating. If you suffer from excessive sweating, please tells us of how it affects you in the comment section below. I’m sure it will help a lot of people who don’t have the courage of talking about it. And please send us an email at info@iontoderma.com to ask us how we can help. Because excessive sweating shouldn’t come between you and your summer fun. Here is an awesome video review of the machine! The machine retails for $399 with free shipping. They also offer a 2 year warranty. Click here to order! Iontoderma is happy to offer a 15% discount for Mommyhastowork.com readers! Just use the promo code MOMMYHASTOWORK and you are good to go. 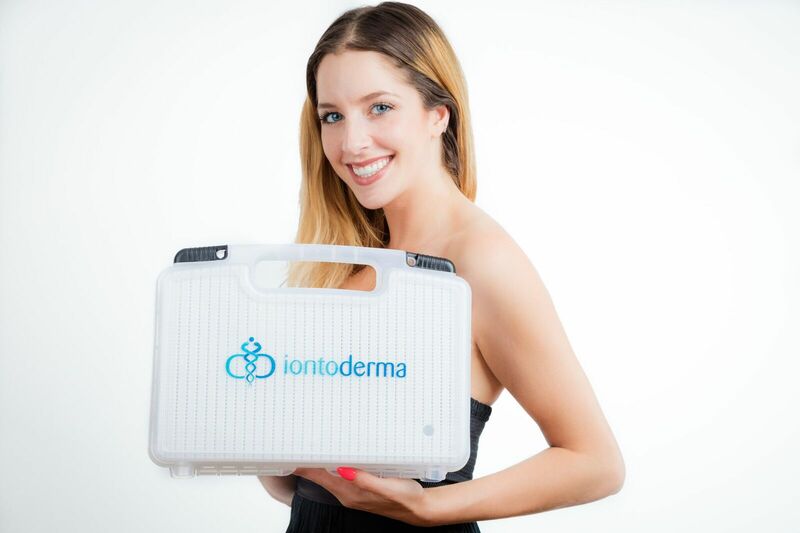 Iontoderma is giving away one machine to a lucky reader! Enter the giveaway link below! US Only. Giveaway ends October 21st. **This is a guest post. I am not affiliated with the company. I think this machine would be worth giving it a try. Not sure if it will help with hot flashes and night sweats, but I’m willing to give it a try. I’ve never seen anything like this, I wonder how well it works. This really does look neat and unique. I would love to give this a try, i am curious now as to how well this may work. I am very curious how this works. It is very different, but I lso think it could be useful too. I am intrigued by this. I am very curious about the results of this machine. I am interested! I know someone who has a problem with hands that sweat profusely …maybe this would help. I also commented on your Nick Jr Christmas post.